Who doesn’t want a personal shopper? Many Walmart customers certainly do. Those who use Grocery Pickup and Delivery tell us that the No. 1 reason they use the service is to save time, followed quickly by enjoying the convenience of shopping in the comfort of their own homes – and also on their own schedules. Grocery Pickup and Delivery are two options we offer today that pair convenience with the everyday low prices customers expect from us. That’s why we’re proud to now be in more than 50 delivery metro areas and have more than 2,000 pickup locations across the U.S. When it comes to Grocery Delivery, we’ve got our foot on the gas. Combined with third-party crowd-sourced delivery providers, we are well on our way to bringing Grocery Delivery to 100 metro areas covering 40% of U.S. households. We officially launched our 50th Grocery Delivery metro area earlier this month in Akron, Ohio – and we have more locations on the way. Ninety percent of Americans live within 10 miles of a Walmart store, and we serve more than 140 million customers a week, which gives us a unique opportunity to make every day a little easier for busy families. Grocery Pickup is one way this is happening, and the best part? It’s a service that’s provided at no additional cost. On Sept. 20, 2018, we’ll officially begin receiving orders at our 2,000th Grocery Pickup location in Fayetteville, Arkansas. 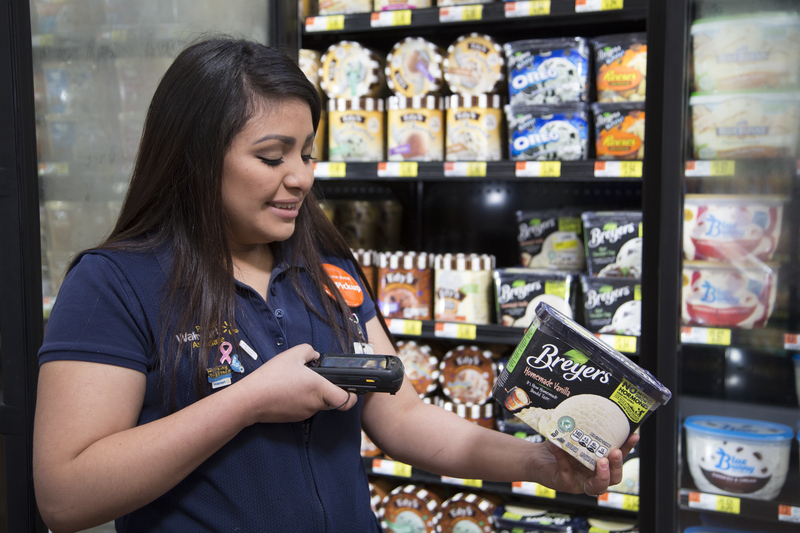 We’re growing fast – in fact, at the end of this fiscal year, we will have 2,140 access points in 430 markets, covering 69% of all households in the U.S.
To order, customers shop Walmart.com/grocery or our Walmart Grocery app to build a basket and place an order, selecting the most convenient location and time for them to pick up their purchases. Afterward, customers receive an email confirmation to let them know the specific location at the store where they will pick up their orders. Next, our personal shoppers get to work. Based on the pickup time, they’ll begin “picking” items, scanning them as they go to ensure an accurate and complete order. With nearly half of all items bought via Online Grocery consisting of fresh items like produce and meat, our associates are trained to be trusted: All personal shoppers must successfully complete a three-week training and certification course before they can pick an order. For Grocery Pickup, our personal shoppers keep orders chilled or frozen right up until they bring them out to customers’ cars. Once customers arrive at the Pickup location, they’ll check in via the app or call a designated number to alert associates that they’re ready. And in metro areas where we offer delivery, our team will request a third-party delivery team to come to the store, pick up the customer’s order, and take it directly to the customer’s location.